It is a SUDDEN change over a few hours or days, and tends to vary at different times of day. People may be confused at some times and then seem their normal selves at other times. People who become delirious may start behaving in ways that are unusual for them- they may become more agitated than normal or feel more sleepy and withdrawn. It may be more difficult to hold a conversation with them or they may ramble and jump from one topic to another. They may not know where they are or think they are some where completely different, on holiday for example. Sometimes people who are delirious may see things that other people can’t see, or believe things that are not true. There are also many other causes of delirium, which, are listed on this page. Anyone of any age can, but it is most common in older people and children. People with dementia are more likely to get delirium and cannot always say what is wrong or how they feel. If you are visiting someone who appears unusually confused they may be delirious and may not remember who you are. Be very calm and patient, avoid being confrontational. Remind them where they are and who you are. Encourage them to drink plenty of water or juice, this can prevent and treat dehydration and constipation. They may need treatment from their Doctor for an infection, pain or other illness. Delirium is NOT permanent in most people. 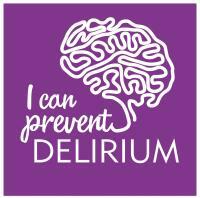 In adults who are fairly healthy delirium may only last a few days once the cause has been found and treated. In older people the effects of delirium can often last longer, and some confusion may still be noticeable for several weeks after the cause has been treated. What should I do if I am worried about my friend or relative? If you are worried about your friend or relative you can talk to a member of staff about your concerns. It is very important to tell a member of staff if you notice that some one has become more confused than usual to make sure that the person gets the care and treatment they need.